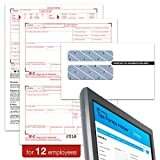 Package includes 6-Part W-2 inkjet/laser forms for 12 employees (forms meet government specifications), 1, W-3 summary form, 12 peel & seal security envelopes & Adams Tax Forms Helper Online. 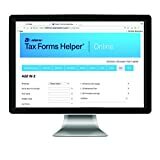 Adams Tax Forms Helper Online for Windows, MAC and other operating systems is an easy way to complete your tax forms and e-file online. Internet and browser required. Works with most browsers. Adams Tax Forms Helper Online for Windows, Mac and other operating systems is an easy way to complete your tax forms and e-file online. 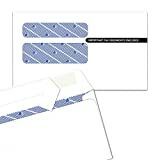 Easy to Use, Safe and secure. Features TLS protocol to keep data secure and US government-standard 256-bit AES encryption. With Adams Tax Forms Helper Online you can e-file Federal and State returns and print copies for employees. 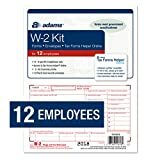 Utilize Adams Tax Forms Helper Online to e-file and print 1099’s, W-2’s, Affordable Care Act, Interest, Retirement, Dividend, W-3 and 1096 Summary Transmittal Forms. Made in the USA. 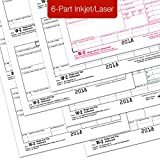 Interested in the Adams W-2 Tax Forms for 2018-6-Part Inkjet/Laser Sets for 12, Three W-3 Transmittal Forms, 12 envelopes and Access to Adams TFH Online (TXA12618)? Is the price too high? You can easily price watch this product and we'll notify you when the price reaches your target.